On Nov. 27, 2018, the Hispanic Association of Colleges and Universities (HACU) will be participating in #GivingTuesday, a nationalmovement around the holidays dedicated to giving in support of non-profit organizations across the country. To donate and help HACU continue its ongoing efforts of Championing Hispanic Success in Higher Education. HACU is the only association that represents Hispanic-Serving Institutions and its student programs include scholarships, internship opportunities and more. This year, we hope you will consider HACU on #GivingTuesday and during our 32nd year of advocacy and representation for Hispanic students and the institutions that serve them across our nation and the world. To find out more on about HACU Giving, click here. 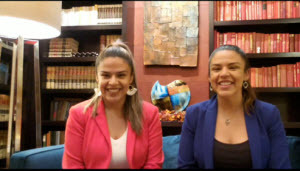 Click the image below or click here for a video of two former interns of HACU's National Internship Program (HNIP). "And thanks to these internships we had so much to add to our resumes..."
"We are so excited to share our success story with you, to highlight how HNIP opened the door of opportunities for us and we hope our story helps inspire the next generation of leaders."